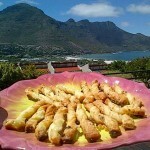 I love to have some home-made nibbles to serve with drinks when I have friends and family around. They are so much more tasty and interesting than shop bought snacks. 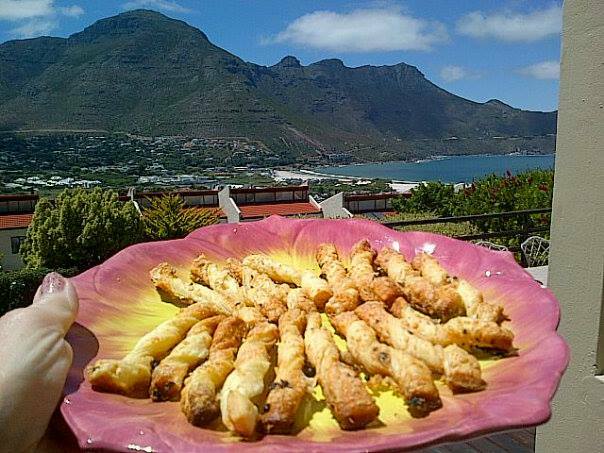 My childhood memories of my parent’s entertaining was helping my mother to make cheese straws in our kitchen, then being allowed to hand them around to the guests before being sent upstairs to sleep. Somehow the smell of freshly cooked cheese and pastry is very homely and perfect to accompany a glass of wine. The cooked pastry looks a bit like dried hay (Paille in French). Grana Padano is one of the oldest hard cheeses from northern Italy, being made near Milan by the Cistercian monks since the 12th century. It has a lovely toasty flavour. With access to good ready-made puff pastry, this type of snack is really quick and easy to make and the taste impresses one’s guests no end. All I do is to lay out the pastry, spread it with olive oil, grated cheese and sprinkle it with some salt Crystals from Guérande, slice it thinly and place in the oven. No skill at all is required. I like to serve a Burgundy chardonnay such as “La Vignée” from Bouchard Pere et Fils with my cheese straws. Brush olive oil lightly over both sides. Use a non-stick baking tray or base. Bake in the centre of the oven for about 12 to 15 minutes until risen and golden.